Tenzing Rigdol: Wrathful Dance, 2014; mixed media on canvas; 36 1/4 x 35 3/4 in. ; collection of Lance and Christine Dublin. Since the mid-1990s, Tibetan artists working in Lhasa began to explore contemporary modes of expression that embody the rapidly shifting world around them. These artists have combined their visual traditions with non-traditional mediums to express their views on contemporary issues, such as migration, displacement, and identity. Come join us as we explore the representational strategies artists working in Tibet and abroad have adopted and adapted. 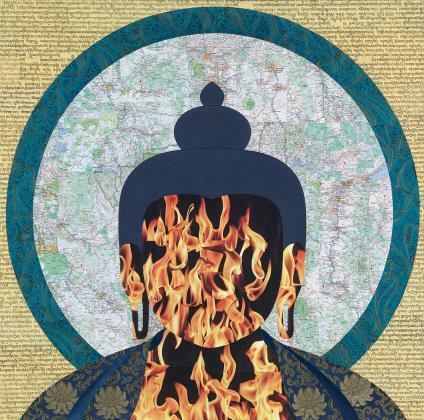 From works by artists trained in traditional thangka paintings to video works produced by academically trained artists, we will examine how artists both local and global face these issues. Having earned her doctoral degree in the History of Art at UC Berkeley, Rosaline Kyo curated Boundless: Contemporary Tibetan Artists at Home and Abroad during her year as a Mellon Postdoctoral Curatorial Fellow at BAMPFA. She specializes in later Chinese and Tibetan art, with a focus on intercultural artistic connections and depictions of ethnic others in Chinese visual culture.